Can I be all crazy, natural mom with you for a minute? Have you seen or read the studies about color numbers and how they make kids hyper-active and crazy? Do you believe them? I didn’t; I mean come on, I used to eat Kraft macaroni and cheese and eat Otter-Pops every day as a kid and I was the best behaved, calmest kid. HA not really, but I definitely wasn’t hyper active. And my sister made macaroni and cheese for my nephew all the time and he doesn’t seem too crazy. My boys are very mild mannered also. They hardly ever cry and almost never throw fits. So when both of them started throwing huge temper tantrums about a month ago, Jeremy and I started doing more research about what could be causing it. Sure, it could be Rohrl’s “Terrible Twos” and yes maybe it’s Statham teething but the fits they were throwing were more than that (One night after Statham had drank a Tummy Yummy he was up All. Night. Long screaming). Everything else we read pointed to the side-effects colored dyes in food have on kids. I decided to look into everything that I was giving them and started cutting out anything with a color and a number (Red 40, Blue 1, Yellow 5). And you know what… the tantrums stopped! No more screaming, no more hitting. Of course there are still times when they don’t get what they want and they cry but it’s nothing like before. The foods and drinks I cut out were some of my boys’ favorites so I have been working on homemade versions of them. This macaroni and cheese was the first one I feel I nailed. Both Rohrl and Statham love it; and it’s so easy to make! I like to make a big batch when I cook it as a side for dinner that way there are extras for lunch and snacks. And you know what makes it so easy? It’s the exact same ingredients as the boxed stuff; just exchange the powder for real cheese. I know not all kids are the same, and not all kids are going to have the same reaction to foods; but if you are looking for a way to get more natural foods in your diet and get rid of processed foods this is a great one to start with. Cook macaroni according to directions on package. Drain water and stir in butter and cheese. Add milk and continue to stir until cheese is melted. To re-heat: place in a microwave safe bowl and heat in 20 second increments until warmed through. Personally, I think this tastes better than the boxed stuff. It’s cheesier and is more filling; which means I eat less of it. This recipe was a win-win all around. Try it out sometime and let me know what you think! My son loves Mac and Cheese! I will have to try out your recipe! I would love if you would stop by my Friday Favorites Linkup and share! I totally agree with you about eliminating chemicals like food dyes as much as possible!! I love how simple this recipe is! Definitely going to try it!! This looks so good. 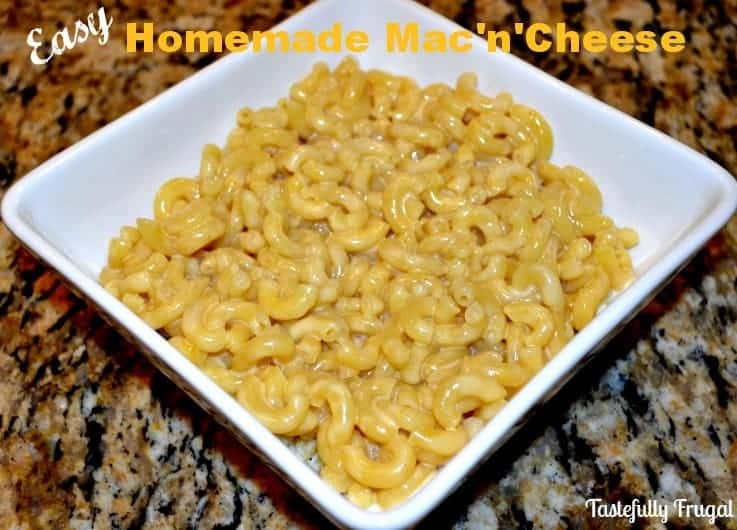 My son is in LOVE with mac and cheese, and I’ve been trying to find a quick alternative to that boxed stuff. I will definitely be trying this out on him! Thanks so much Kristen! My boys are huge fans too and they gobble this dish up like there is no tomorrow! I hope your son likes it too! 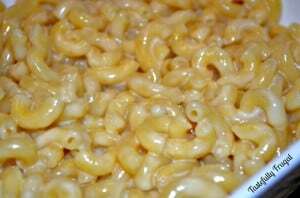 I love homemade mac and cheese! It’s the perfect comfort food. I rarely eat pasta, but every now and then I just need some good ol’ mac and cheese. Thanks for linking up with Hump Day Happenings. Thanks for hosting such a fun party Bobbi! Thanks for sharing! I’ve pinned your recipe to the Creative K Kids Tasty Tuesday board.